Radio One of Raleigh presents Women’s Empowerment 2015. Women’s Empowerment & Networking Expo was created in 1995 in honor of Women’s History Month. This event was formed with the purpose of inspiring, encouraging and educating. Throughout this expo style event workshops, seminars and lectures are conducted that focus on physical, mental, spiritual, financial and emotional health. The goal of this entire event is to motivate, inspire and rejuvenate all that are in attendance. Each year, Women’s Empowerment features a noteworthy motivational speech by an internationally recognized speaker. This year’s keynote speaker will once again be charismatic leader, visionary, provocative thinker and entrepreneur Bishop T.D. Jakes. 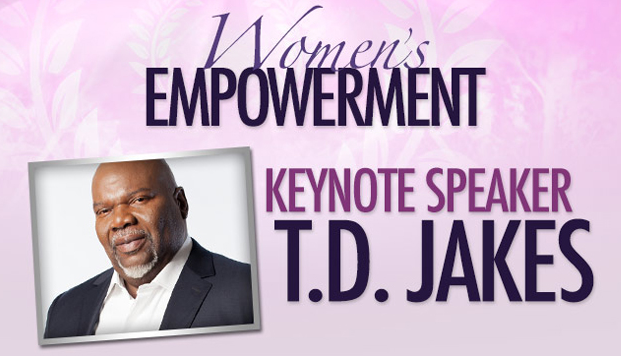 Bishop Jakes inspired a sold-out crowd at Women’s Empowerment 2013 and Radio One is delighted to welcome him back as this year’s keynote speaker. Bishop Jakes serves as senior pastor of the The Potter’s House, a global humanitarian organization and 30,000 member church located in Dallas. Named “America’s Best Preacher” by Time Magazine and CNN, Jakes’ voice reverberates from the world’s most prominent stages. Radio One, Inc., together with its subsidiaries (http://www.radio-one.com/), is a diversified media company that primarily targets African-American and urban consumers. The Company is one of the nation’s largest radio broadcasting companies, currently owning and/or operating 54 broadcast stations located in 16 urban markets in the United States. Through its controlling interest in Reach Media, Inc. (http://www.blackamericaweb.com/), the Company also operates syndicated programming including the Tom Joyner Morning Show, the Russ Parr Morning Show, the Yolanda Adams Morning Show, the Rickey Smiley Morning Show, Bishop T.D. Jakes’ “Empowering Moments,“ the DL Hughley Show, and the Reverend Al Sharpton Show. Beyond its core radio broadcasting franchise, Radio One owns Interactive One (http://www.interactiveone.com/), an online platform serving the African-American community through social content, news, information, and entertainment. Interactive One operates a number of branded sites, including News One, UrbanDaily, HelloBeautiful and social networking websites, including BlackPlanet, MiGente, and Asian Avenue. In addition, the Company owns a controlling interest in TV One, LLC (http://www.tvoneonline.com/), a cable/satellite network programming primarily to African-Americans.